The Durand Line (in red) between Afghanistan and British India. It was named after Mortimer Durand, a British diplomat and civil servant of colonial British India. The Durand Line was a frontier boundary between Afghanistan and British India. It was established after an 1893 memorandum of understanding (MoU) between Mortimer Durand of British India and Afghan Amir Abdur Rahman Khan. Referred to as a frontier line, it is named after Mortimer Durand who was the Foreign Secretary of colonial British India at the time. Later on Abdur Rahman Khan's successor, Amir Habibullah Khan signed a new agreement with the Britain which again confirmed the legality of the Durand Line. After Amir Habibullah Khan, King Amanullah Khan accepted Durand line as international border between Afghanistan and British India after signing Anglo-Afghan treaty of 1919. The article 5 of the Anglo-Afghan Treaty of 1919, on the basis of which Afghanistan reclaimed its independence, says that Afghanistan accepted all previously agreed border arrangements with British India. Hence, Afghanistan itself has recognized Durand line as international border. The Durand Line cuts through the Afghan tribal areas, politically dividing ethnic Pashtuns and Baloch people who live on both sides. 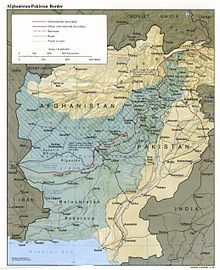 Although durand line is internationally recognized by many countries as the western border of Pakistan, it remains unrecognized by post 1947 Afghan governments. It has also been recognized as international boundary by the United Nation. Afghan Pashtun leaders claim Pakistani territories and say that the Durand Line is "an issue of historical importance for Afghanistan. The Afghan people, not the government, can take a final decision on it." However, non-Pashtuns Afghans have always recognized durand line as international border between Pakistan and Afghanistan. Similarly, Pakistani Pashtuns have also recognized Durand line as international border between Afghanistan and Pakistan. ↑ "Why the Durand Line Matters". The Diplomat. ↑ Smith, Cynthia (August 2004). "A Selection of Historical Maps of Afghanistan - The Durand Line". United States: Library of Congress. Retrieved 2011-02-11. ↑ "Afghanistan ready to OK 9 US bases after 2014 troop pullout, Karzai says". Associated Press. 25 March 2015. ↑ "Nationalists against raking up border spat". www.pajhwok.com. ↑ 5.0 5.1 "No change in stance on Durand Line: Faizi". Pajhwok Afghan News. October 24, 2012. Retrieved 2013-04-11. ↑ Grare, Frédéric (October 2006). "Carnegie Papers - Pakistan-Afghanistan Relations in the Post-9/11 Era" (PDF). Retrieved 2011-02-11. ↑ "Afghan parliamentarian backs Durand Line as border". Express Tribune. This page was last changed on 22 February 2019, at 19:18.